DELRAY BEACH, FL: Four of the current Top 20 singles players, the greatest doubles team of all time, and the 2001 Wimbledon champion are all included in a group of players who have signed on with the Delray Beach Open by The Venetian® Las Vegas to play in the 22nd annual event next February. 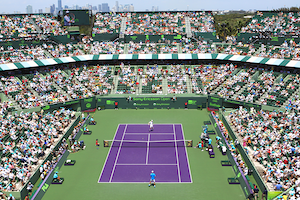 The world’s only combined ATP World Tour and ATP Champions Tour event will be played February 14 – 23, 2014 at the Delray Beach Stadium & Tennis Center. It will be the 16th year that the tournament will be held in Delray Beach. 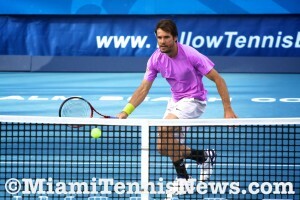 The 32-player ATP World Tour field will include Top 20 stars Tommy Haas (No. 12), John Isner (No. 14), Kei Nishikori (No. 18) and Kevin Anderson (No. 20). Janko Tipsarevic, last year’s ATP world No. 8, former world No. 1 and two-time Grand Slam champion Lleyton Hewitt and former world No. 8 Marcos Baghdatis are also among the early entries. The remaining Delray Beach field, including three wild cards, will be announced in January. Hewitt (1999), Haas (2006), Nishikori (2008) and Anderson (2012) are former Delray Beach champions. The world No. 1 Bryan Brothers doubles team will highlight the 16-team doubles field, as the popular twins return to Delray Beach for the seventh time after winning titles in 2009 and 2010. Bombastic Croat Goran Ivanisevic, the only Wimbledon champion in history to have won on a wild card, will join 2003 US Open champion Andy Roddick and four other former ATP stars in Delray Beach’s 5-year-old ATP Champions event. Ivanesivic is playing in Delray Beach for the first time. Roddick committed to his inaugural ATP Champions Tour event in August, while Hall of Famer Mats Wilander is returning for a fourth run at the title. The trio of former two-time Delray Beach ATP World Tour champion Jan-Michael Gambill (2001 & 2003), former French Open finalist Mikael Pernfors and Boca Raton’s Aaron Krickstein round out the field. The competition will be divided into an “American” group (Roddick, Krickstein & Gambill) and a “European” group (Ivanesevic, Wilander, Penfors), with the winners playing a “USA vs Europe” championship match. The Delray Beach Open by The Venetian has moved one week earlier on the ATP World Tour calendar. 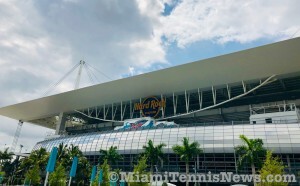 The three-day ATP Champions Tour event will kick off on Valentines’ Day, Friday, Feb. 14 with two evening matches featuring Roddick, Ivanisevic, Gambill and Wilander. 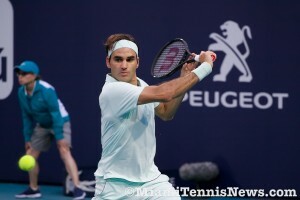 The ATP Champions Tour final will be played Sunday, Feb. 16 at 3:00 pm. The ATP World Tour three-day qualifying rounds begin Saturday, Feb. 15 with the main draw beginning Monday, Feb. 17. The doubles final is scheduled for Sunday, Feb. 23 at 1:00 pm followed by the singles final at 3:00 pm. 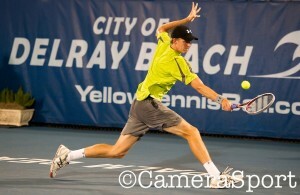 To purchase tickets, check playing schedules, or to obtain more information, please go to www.YellowTennisBall.com, call 561-330-6000 or visit the Delray Beach event’s box office at 30 NW 1st Avenue, Delray Beach, FL. The Bryan Brothers, 2009 and 2010 Delray Beach champs, are 8-time year-end world No. 1 doubles champions. The pair are the first doubles team in history to hold all four Grand Slam titles as well as the Olympic gold medal at the same time. They have 92 career ATP titles, including 15 Grand Slam wins. Tommy Haas has returned to the Top 20 from major surgery three times in his career. The 2006 Delray Beach champion has twice been the ATP’s “Comeback Player of the Year” and is currently ranked No. 12 in the world. Haas has won more than $12 million in prize money. Top-ranked American John Isner, who has back-to-back semifinal finishes in Delray Beach, reached a career-high No. 9 in the world in 2012 and enjoyed 18 weeks in the Top 10. He reached the 2011 Australian Open QF and his first Master Series final in Indian Wells that year. He finished No. 1 among ATP players in aces two of the last three years, and has garnered 7 career ATP titles. Kei Nishikori won his first ATP title in Delray Beach in 2008 as an 18-year-old, and reached his first Grand Slam QF at the 2012 Australian Open. The top all-time Japanese player with rock star status has reached No. 11 in the world this year and is positioned to become the top Asian tennis player of all time. Kevin Anderson is enjoying the best year of his career, reaching three finals in 2013, and currently No. 20 in the world. In addition to his Delray Beach title in 2012, he has reached two QFs in his new hometown. Anderson established a residence in Delray Beach over the summer. 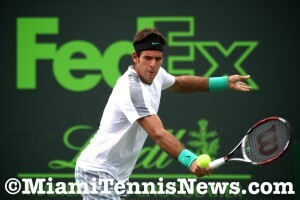 Janko Tipsarevic, the 2011 Delray Beach runner-up to Juan Martin del Potro, finished 2012 as the year-end No. 8 in the world. With 4 career ATP titles, a 2012 US Open QF finish and the 2010 Davis Cup title, the Serbian has enjoyed two straight Top 10 seasons. An 18-year-old Lleyton Hewitt won the first ATP tournament held in Delray Beach (1999). The No. 1 player in the world for the 2001 and 2002 seasons won Grand Slam titles at the 2001 US Open and at Wimbledon in 2002 and has five Top 10 year-end finishes, including four in the Top 5. Marcos Baghdatis was a 2006 Australian Open finalist and became the ATP’s breakout performer that year, reaching a career-high No. 8 and finishing the season at No. 12. Baghdatis was also Top 20 in 2007 and 2010. 2003 US Open champion Andy Roddick will be making his ATP Champions Tour debut in Delray Beach, a venue where he began his pro career with a pair of wild cards in 2000 and 2001. He finished No. 1 in the world for 2003, and had an incredible run in the Top 10 from 2002 – 2010. Roddick led the 2007 US team to the Davis Cup title. Goran Ivanisevic garnered 22 career ATP wins but his greatest moment was winning the 2001 Wimbledon title 11 years after he won his first title. He achieved a career-high No. 2 ranking and finished in the Top 10 five times in his career. Hall of Famer (2002) Mats Wilander is one of only five men to win Grand Slams on every surface. The Swede won the first of his seven Slam titles at the French Open as an unseeded 17-year-old. He was the No. 1 ranked player in the world in 1988, won 33 ATP titles and three Davis Cup titles. Seeded seventh and ranked 36th in the world, Kevin Anderson was the outright favorite over qualifier Marinko Matosevic in the Delray Beach International Tennis Championships final. Although it was no cakewalk, Anderson managed to fend off Matosevic 6-4, 7-6 to bank the trophy. Matosevic was attempting to become the third qualifier to hoist the big prize and the fifth Australian to win the ITC. The last Aussie was Lleyton Hewitt in 1999. Anderson was the first South African to advance to the final in the history of the tournament. In the battle of the giants, Kevin Anderson prevailed over top seed John Isner 7-5, 7-6 to reach the final of the Delray Beach International Tennis Championships. 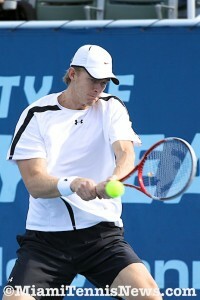 Anderson interrupted an All American semifinal by beating fourth seed Andy Roddick in the prior round. Before this match, Isner had yet to drop a set this week. Isner, the world number eleven, had a slim edge over Anderson in their record of 3-2.